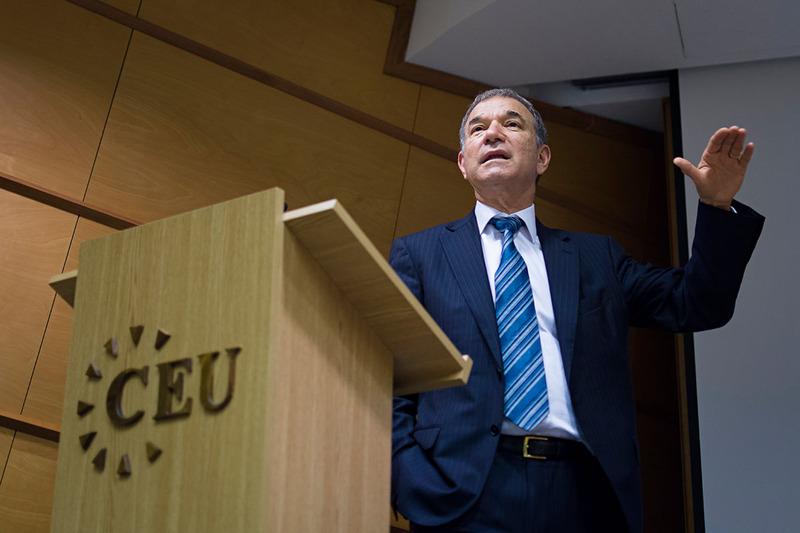 In a lecture as part of of CEU’s inaugural Humanities and Social Sciences Initiative series, Stephen Greenblatt, Cogan University Professor of the Humanities at Harvard University, enlightened a crowd filling the CEU auditorium on how the "intolerable" ideas Lucretius’ poem “De rerum natura” (“On the Nature of Things”) rediscovered in 1417 managed to be transmitted in an age that had no concept of tolerance. 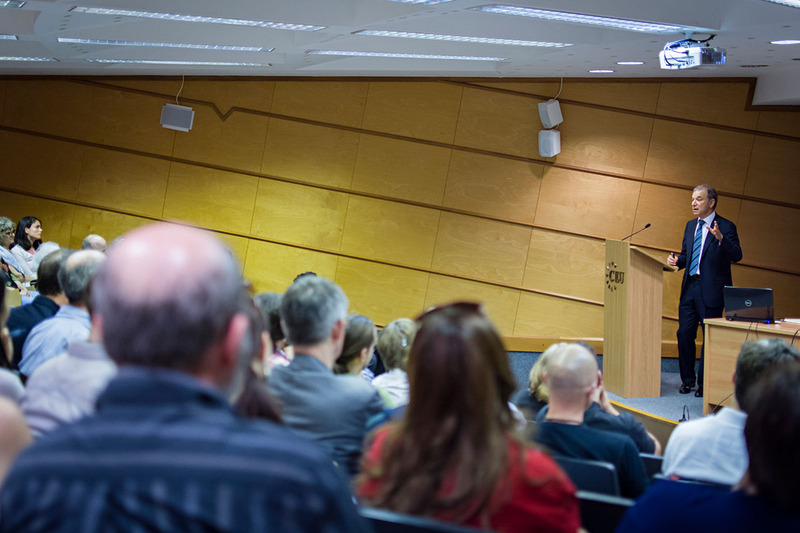 Greenblatt, introduced by CEU President and Rector John Shattuck at the May 23 event as the “world’s leading interpreter of cultural and literary energy” and a “rock star,” painted a very vivid picture of the Europe where the spirit and views of St. Augustine were still dominant. Augustine sought to promote an unshakable Christian theology. Augustine advocated a “single truth” of Christianity; he didn’t allow for choice, for choice was considered heresy. By a unique interpretation of the parable of the weeds (Matthew 13:24-29), Augustine’s views on heretics was plain, “bound them together and burn them,” he said. In some cases, murderous intolerance was the result of monotheism, universalism, and dogmatic absolutism, Greenblatt explained. Lucretius’ “De rerum natura,” written in the first century BC and recovered in 1417, had shocking arguments based on Epicurean philosophy and physics, similar to modern quantum mechanics. What Greenblatt called the “intolerable propositions” were the following: the universe has no creator; nature happens by her own will; nature ceaselessly and randomly experiments; the world wasn’t created for or about humans; humans are not unique; the soul dies; all organized religions are superstitious; religions are invariably cruel, they are born of fear and bring forth fear; and the highest goal of life is the enhancement of pleasure and the reduction of pain. All these statements were scandalous in the early 15th century when the poem suddenly resurfaced, as there was no tradition of this kind of thinking in Europe. The poem posed an “unnerving challenge when the Renaissance was at its most radical,” Greenblatt said. Giordano Bruno was burnt at the stake for raising the same issues 150 years later, so how was it possible for Lucretius’s poem to survive? “How was the intolerable tolerated?” Greenblatt asked, and offered three explanations: reading strategies, scholarship, and aesthetics. Margin notes in contemporary copies show that readers didn’t focus on the large scandalous sections – in fact they tended to skip through them, but made comments and corrections in individual lines. Greenblatt illustrated this point by showing the audience an image of a 15th-century copy with a single line of the poem on the page surrounded by comments. From the second half of the 15th century, “De rerum natura” was printed as a school text with accompanying commentaries to put the beautiful and difficult Latin text into context. And lastly, printed disclaimers explained to readers that although the content was alien to Christian belief, it could be easily refuted, and the pure aesthetics of the poem had to be acknowledged. Although the first English translation of “De rerum natura” appeared only in 1682, Edmund Spencer and William Shakespeare borrowed images, even whole passages from Lucretius, giving the once intolerable poem a new life. Stephen Greenblatt is Cogan University Professor of the Humanities, Harvard University. His honors include the 2012 Pulitzer Prize and the 2011 National Book Award for The Swerve, MLA’s James Russell Lowell Prize (twice), Harvard University’s Cabot Fellowship, the Distinguished Humanist Award from the Mellon Foundation, Yale’s Wilbur Cross Medal, the William Shakespeare Award for Classical Theatre, the Erasmus Institute Prize, two Guggenheim Fellowships, and the Distinguished Teaching Award from the University of California, Berkeley. The event was sponsored by the Office of the Provost.